A-Rod had a rough start to the 2012. The problem is that Rodriguez has been plagued by injuries and other problems throughout the course of the season. The Yankees, meanwhile, have struggled at times, with many fans wondering if the Bronx Bombers would be able to catch up with, and overtake, the seemingly dominant Baltimore Orioles. Now, however, with the Orioles becoming the team that is struggling, the Yankees have turned things around. The same can also be said about Alex Rodriguez. 2012 was supposed to be an important season for Rodriguez as he was poised to break some major league baseball records if he could remain healthy and continue to produce the runs. As things stand now, A-Rod has 644 career home runs. By any standard that is impressive. He also has 316 stolen bases, which means he is a dangerous opponent tp pitchers even if he gets on base, and makes him risky to walk. He has an overall stat of 2,872 hits and 1,937 runs. The Orioles and Yankees are still locked in a battle for a trip to the post-season. The Orioles came out of nowhere, and at times were one of the hottest teams in baseball. The Yankees, meanwhile, are always a threat, but they were quiet for much of the early part of the season, which caused many to write them off. As for A-Rod, his problem as the season draws to a close has been injuries. In July, just as he was heating up and starting to hit balls out of the park like he had before, he fractured his left hand. This put him on the disabled list. While some Yankees fans were almost relieved by this, many experts on baseball said that this was a major blow for the team. Fortunately, other players on the team stepped up and kept the Yankees competitive. 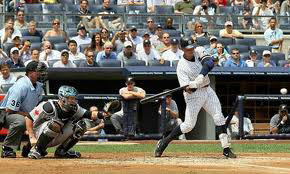 Just recently, however, having just come back from the disabled list and trying to get back on track as the Yankees prepare for the playoffs, an injury struck A-Rod again. This time it was a game against the Minnesota Twins. Alex Rodriguez fouled a ball off of his foot and injured himself so bad he ended up back on the disabled list. Right now fans are still hoping that the Yankees can clinch that division championship and then head for the league championship. For fans of Alex Rodriguez, the question is can he recover from his host of injuries to suit up and play during any post-season play the Yankees get. If he is suited up and ready to play, he remains a playoff threat to anyone he faces. Time will tell if 2012 will be a major turnaround year for the Yankees and A-Rod or of fans will still debate whether or not it is time for A-Rod to go.